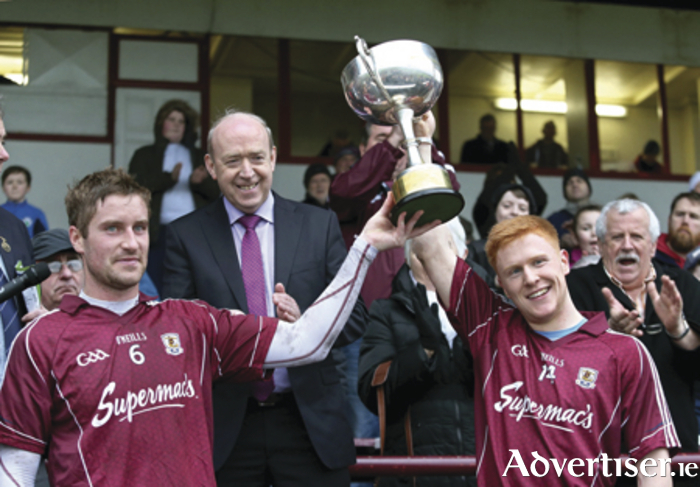 Pictured right: joint Galway captains Gary O'Donnell and Adrian Varley celebrate after they were presented with the cup after Galway defeated Roscommon at the FBD Connacht League Final at Tuam Stadium. Also in the photograph is Tommy Kelly of FBD. The Galway footballers start off their NFL campaign this Sunday away to Laois in O’Moore Park (2pm ). Laois have beaten Galway in the past three seasons and Kevin Walsh will have his men revved to reverse that trend against a Laois side under new management following the resignation of Tomás Ó Flatherta last season. Galway are 10/11 to win and, despite the unavailability of Gary Sice, the Sweeney twins, Gareth Bradshaw, Finian Hanley and the loss of Michéal Lundy to the USA for a year, Galway football supporters will be travelling on Sunday hopeful of a winning start to the league. Big displays will be needed from Paul Conroy and Fiontán Ó Curraoin around the middle third, Damien Comer and Adrian Varley up front, and a probable half-back line of Liam Silke, Gary O’Donnell and Johnny Heaney to garner the two points. Anything but a victory will be a disappointment. And with Tyrone coming to Pearse Stadium seven days later, a winning start is crucial.